Yesterday, I connected up with an old friend for a few hours in the late afternoon. He was without a car so I picked him up at the Half Price book store which he had walked to after getting his hair cut. We settled on the Alligator-whatever-it-is next to the book store as a reasonably decent place to catch up. Jeff's been in Louisianna lately because that's where much of the movie action is these days, and he's definitely in that business. Towards the end of our chat, he said, "Did you hear that the WHO announced that there have been 7 confirmed deaths from the Swine Flu?" Jeff's a serious guy, and a former reporter, so I didn't just PooPoo his claim, but the story didn't resonate with my physician partner who I immediately called for confirmation. Later in the evening I saw the story on one of my lefty type news services, but even then, I wondered if the story was somehow manufactured. In my mailbox this morning, confirmation of the accuracy of the lower numbers was found, thanks to the Australians. Vivienne Allan, from WHO's patient safety program, said the body had confirmed that worldwide there had been just seven deaths - all in Mexico - and 79 confirmed cases of the disease. Unfortunately that [150-plus deaths] is incorrect information and it does happen, but that's not information that's come from the World Health Organisation," Ms Allan told ABC Radio today. "That figure is not a figure that's come from the World Health Organisation and, I repeat, the death toll is seven and they are all from Mexico." "The Federal Government's pandemic plan, a 132-page manual issued to medics, media and the public, insists that once the world reaches phase five, Australians should stock their pantries with food and bottled water to last 14 days, check on elderly neighbours and put emergency numbers by the phone." So, stock up, but don't panic. The H1N1 story is not just an abstraction for me. Last Friday, two good friends and I made what was, by all standards, a very uneventful crossing to our respective homes in Mexico. Our little village is in the State of San Luis Potosi, not that far from one of the epicenters of the disease. After a long day of driving, we ate dinner, went to bed, and woke up the next morning to find ourselves reading in the San Luis newspaper about some kind of swine flu deal. Since, we were hatching some plans to go to the desert to be with a Shaman for a couple of days, I called home, asked my Dr. partner for some advise, and headed for the sacred lands. We remarked to ourselves as we bounced down the narrow mountain road that leads from Catorce to the altiplano below that this was a good start for a horror action movie. You know, four guys head out to the wilderness only to find upon their return that the world had changed. Well, when we did get back, there were no bodies on the side of the road, but there was a lot of angst, and the usually large weekend crowds that flock to this magic pueblito were non existent. It was, like the pueblo fantasma above, a ghost town. 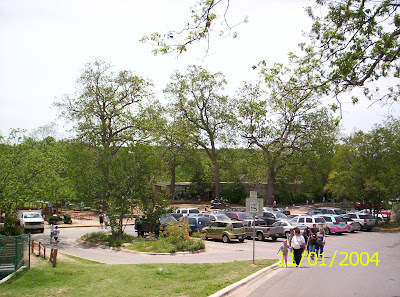 "Here in San Luis every thing under control in an indoors routine till the 6th that activities start again.The only Hospital general, is a 5th world hospital, worse than Thailand in the 80's. How could they be able to analyse, isolate the virus, and be sure what is is? In Matehuala they say there are cases, how could they be able to know for sure what it is? When Obama was in Europe at the G20 briefing, Angela Merkel said that Mexico is ready to become the 51st star of the USA flag. That was her only comment. Who created this big game? Secretaría de Hacienda is getting millions off dollars for the flu. The statistics say that every 10 minutes a child dies of dehydration since years and nobody says anything." I wrote back, "There are many reasons to think many things about this event. But whatever we might think, it appears to be dangerous." With some of the more sophisticated folks in the village, I talked about disaster capitalism and how certain forces use natural and unnatural disasters to bring about economic and civic changes that could not occur without the event. We talked about the Shock Doctrine, Naomi Kline's seminal work describing decades of disaster capitalism. Yes, a Pandemic will be very good for some folks. And very bad for a lot of others, like the Mexican tourist industry for example. It won't help the global economy either which arguably already has a possibly fatal case of the pig flu. We got out of Mexico and left our little village as soon as we could. We weren't sure if the border would close, or we would be subject to quarantine, as phobic politicians began to demand that we close our borders completely. By the time we were on the road, some of our politicians were already in their fear gear even as the CDC expressed their views of its limited value. As we made our way back, we saw our first signs of the look of Pandemic. 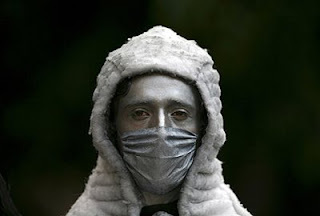 Almost everyone on the road who was in public, such as food handlers or toll collectors, had masks and gloves. 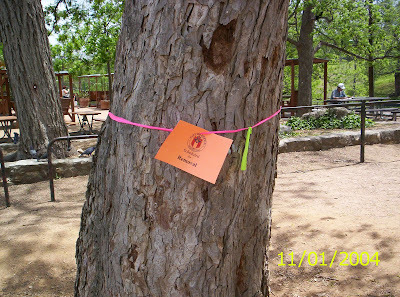 At the Casita de Cobre, there were signs and handouts. The army set up check points. We saw one ambulance that had picked up at least one sick member of one traveling family. We applied hand sanitizer everytime we paid a toll or bought gasoline. When they did ask us how we were feeling, we told them we were fine. But at the immigration stop further in, the health issue wasn't even mentioned. Like our trip down, the trip home from Catorce was more or less uneventful. I'm working at home, in three days of self quarantine. And I carry hand sanitizer everywhere. It doesn't mean it's not dangerous. Fourteen days of food and water might be a good idea too. 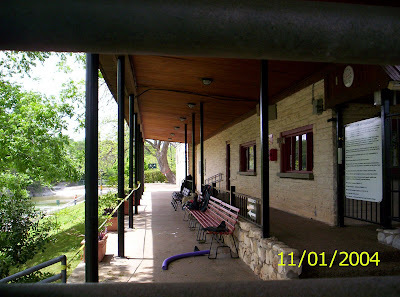 See Twitter updates at end of post, ps use links within this message to ask Austin City Council, our new PARD Director, Sara Hensley, the Parks Board members and the Env. Board members to SAVE OUR TREES. 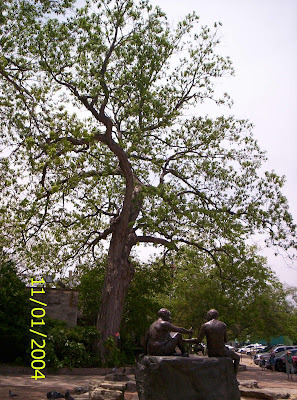 tell Council to save our trees. 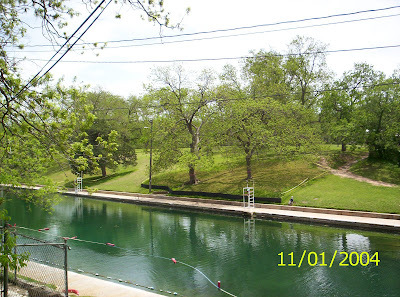 for the Barton Springs Master Plan. Take a closer look at the front gate canopy. Does it look dead, dangerous to you? 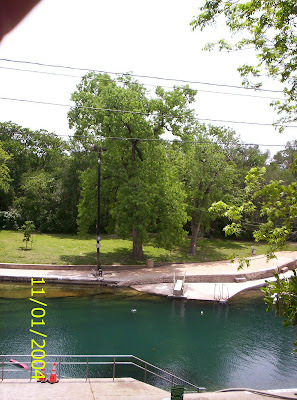 of the shade at Barton Springs -- all at once? 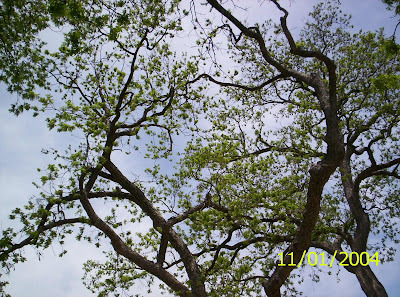 to be 300 - 350 years — are the State Tree of Texas. other, non-native in some cases, species. 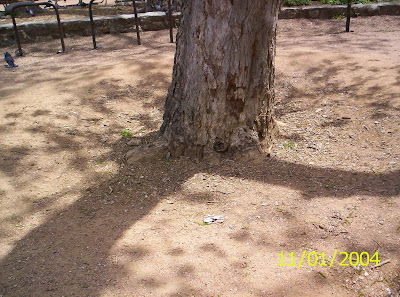 the health of the tree. isn't that the nature of trees? 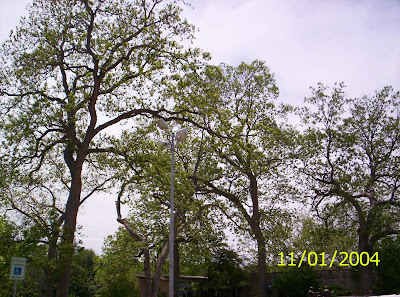 These Cottonwoods will both be disappeared. Look Mommie, a piece of the clouds! were healthy and didn't need to go. bonds to come at later date. and must be cut down. 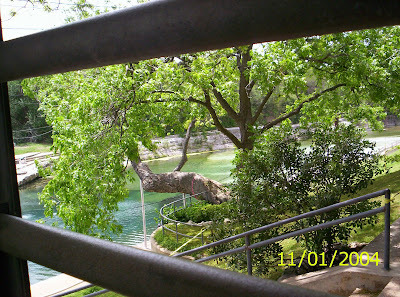 the woods behind the diving board. gone, and at least one other from the top of the hill. Anyone checked UV ratings lately? Better get some stronger sun screen. These trees along the pool shade the water. two years. It will be worse without trees. so get ready for more muck. to the front of the house. The trees slated to cut are about 200 years old. It will be decades before our shade grows back. the courtyard next to the front gate to the pool. concrete -- packs to a hard impervious cover. and it would be in the way. What would Dobie, Beticheck and Web think? is also marked for the cut. to a proposed renovation or construction project. Looks like a branch or two here could be trimmed? are planning to kill it? maps show different trees for cutting, etc. health, making them safe for people in public places. will someday take over it's sacred place above the springs. local icon, guardian of the Springs? or liabilities in a lawsuit. the verge of global climate disaster. 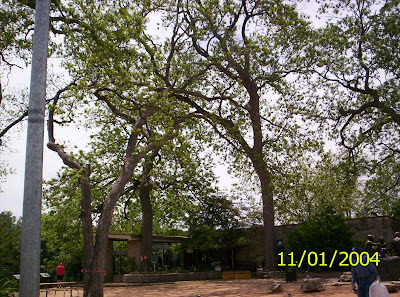 Click to see Austin New Real program: Tree Friendly Paradigm featuring Susan Bright (SB), John Corey (arborist) and Pam Thompson (show host) recorded 23rd, tech by Stefan Wray. The always creative and constantly cartooning C. L. spent the night last night and he left this cartoon on my desk. Pretty much says it for last week's Faux arama. And just in case you needed proof that Boehner really is dumb. Last Thursday, I once again did something that over my entire career, I have done a lot. It goes something like this. You get in the car or plane at the break of day and you spend half of the day getting somewhere. And once you get there, after a getting out and inspecting a few things, you come right back. It's a little bit like running I guess. Wind resource guys like myself are kind of a special breed I suppose. You have to love the land and the earth so much, that you enjoy just moving around on it. And even though you very much have a destination, it's not really where you are going. All this means that in order to do what guys like me do, you have to be happy with where you are. Because when you do get to where you want to go, you immediately leave again. Sure, you might be back, and you might be back a lot if the project begins to develop. I don't know if all wind guys or for that matter solar guys feel like I do, but there's something really special about transporting three or four hundred miles to look at a place, then turning around , hopefully arriving home before the end of the day. This particular trip was a bit like time travel. Just three hundred miles north of here, it's still almost winter. The grass and the trees still look like winter. Flowers are just now beginning to bloom as spring is just now showing its remarkable splendour. Of course, I know the site from the maps and from flying around it on Google Earth with their cool new flight simulator, but nothing beats actually being there. "Being there" is essential. Chauncey had it right. Maybe its a product of age or simply a return to our natural condition, but I very rarely actually look forward to getting somewhere these days. That "somewhere" is more like a mirage on a long stretch of hot road. It doesn't exist. What does exist is Now. I know that this statement is a bit trite and it certainly is overused in certain metaphysical circles; but, I also realize that "Being in the Now" is much older than Ram Das or Eckart Tolle. When I was a child, my life was all about waiting. I would wait for my favorite TV show, the all important ball game, my date with Marsha, or to finally get my drivers licence and the car I had been saving for. I would count the tractor rows left on the field, and the cattle waiting to be squeezed and dehorned. When I became a musician, I would eagerly await the lights and excitement of the gig. Over the last seven years, I have been writing a book called "Beyond". And the first chapter is "Doors", the door of the eternal moment to be exact. Since I finally have the cover and the chapter art, the liner notes, the manuscript itself, and all the folks and resources to get the book published, I suspect that we're getting there. This being said, you can't confuse "being present" with being complacent. "Being present" does not mean that we ignore the future, or that we forget the past. Electing Barack Obama is, was, and will be one of the most significant developments in redirecting our course on this earth. But, the momentum of our culture is immense. Last Thursday, as I was chasing the Wind, George Monbiot was describing the G 20 meeting. Here is the text of the G20 communique, in compressed form. This suggests to me that our leaders have learnt nothing from the financial crisis. It was caused by allowing powerful agents (the banks) to exploit a common resource (the global economy) without proper control or regulation. Governments deployed a form of magical thinking: that the boom would go on forever, that a bunch of predatory psychopaths would regulate themselves, that profits, dividends and share prices could grow indefinitely even though they bore no relation to actual value. They treat the environmental crisis the same way. Climate breakdown, peak oil and resource depletion will all dwarf the current financial crisis, in both financial and humanitarian terms." But they're not there Now.